Having passed the autumnal equinox I hadn’t expected any more flowers from my lophs – nevertheless two of them decided to bloom this week, one for the first time. 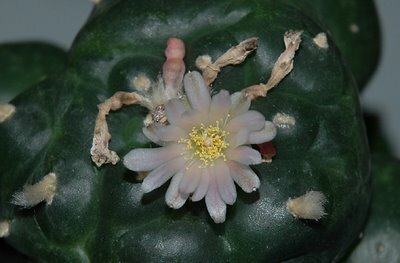 My grafted Lophophora williamsii (SB 854; Starr Co, Tx) has been flowering abundantly all summer. Several fruits have already ripened and more are budding; still the plant took the opportunity to squeeze in yet another flower before going dormant. The flowers of this plant are quite large, approximately 2.75cm (~1.1'') in diameter. 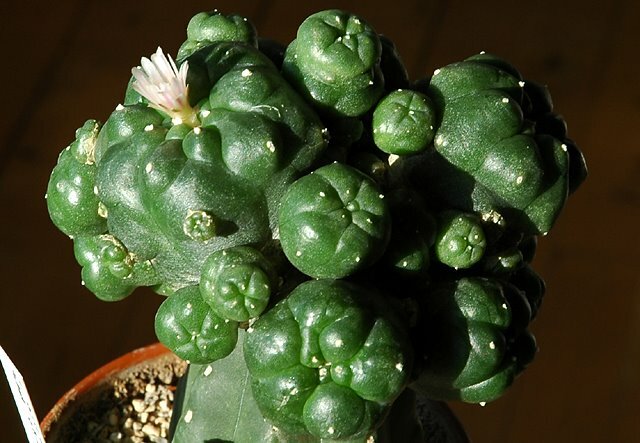 The Lophophora williamsii var. caespitosa graft has been growing profusely but never felt like flowering before now. The flowers are small, less than 2cm (~0.8'') in diameter, compared to those of L. williamsii (SB 854; Starr Co, Tx), and the midstripes are a slightly darker shade of pink. 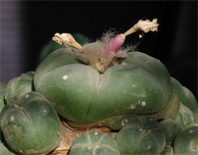 The scion used for this graft was taken from the plant shown in the blog profile. Unfortunately this plant later caught rot and died. After a lengthy gestation period, the New Cactus Lexicon was published this summer. For ease of handling it’s divided into two volumes – the text volume is a concise alphabetical catalogue of cactus genera, species and subspecies accepted or proposed in the current standard literature on cacti, while the atlas volume contains more than 2500 illustrations covering nearly all of the species and subspecies recognized in the text, sometimes with two or more images. 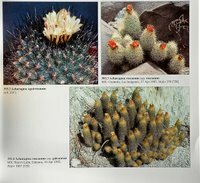 With its 526 pages of illustrations this volume is a stunning visual masterpiece, and the most comprehensive pictorial record of cacti ever published (the slightly blurred quality of the examples is entirely due to my reproduction). The aim of the atlas volume is to illustrate all of the recognized species, with an emphasis on using photographs of plants in habitat at a specified locality or in cultivation from a known source, whenever possible. The entries in the atlas are not grouped alphabetically but rather ‘like with like’, making it easier for the user to compare related species or identify unnamed plants. 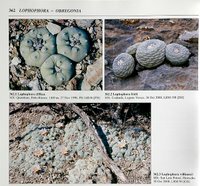 The text volume comprises 373 pages and is a no-frills dictionary of the currently recognized genera, species and subspecies of cacti. It does not include any chapters of general information about the family, its history, morphology, ethnobotany, cultivation and so on – so don’t expect an encyclopedic work like Anderson’s The Cactus Family or Benson’s Cacti of the United States and Canada. 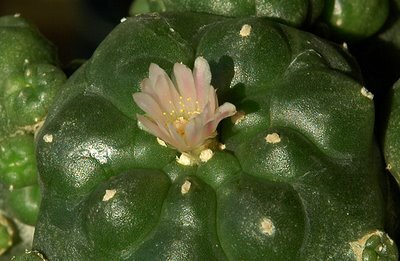 David Hunt is a known lumper and some of the main genera changes (Parodia now includes the former Notocactus, Echinopsis including Lobivia and Trichocereus etc.) have already been the cause of much debate (maybe that’s the reason for Hunt quoting Bill Bryson for having said “Taxonomy is sometimes described as a science and sometimes as an art, but really it’s a battleground” ;-). Still, there has been room for some splitting , e.g. 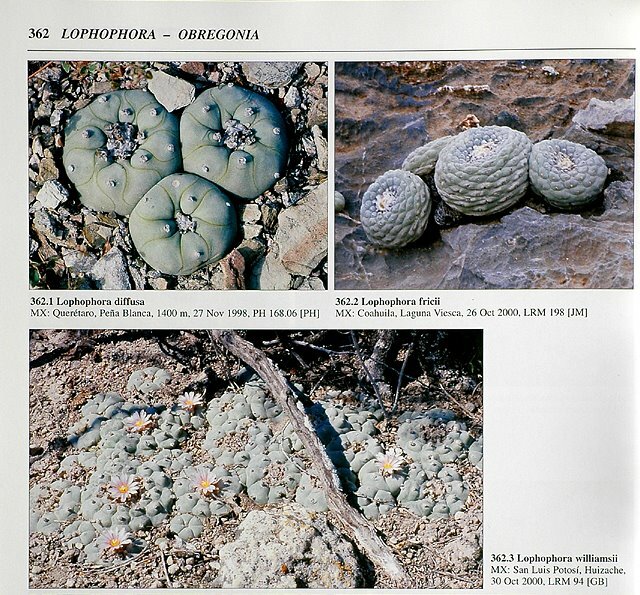 the division of Opuntia has added 12 genera, Lophophora fricii is now recognized as a valid species, Acharagma is not submerged in Escobaria, etc. Whether you agree with Hunt’s classification or not, the New Cactus Lexicon is an excellent reference and certainly will become the reference book for years to come. As already mentioned the atlas volume is in a league of its own with excellent illustrations of the majority of the recognized cacti species and subspecies. You can find more information on the New Cactus Lexicon in this post. The book can be acquired directly from dh books or from specialized bookstores like Rainbow Gardens Bookshop or Keith’s Plant Books.